�KILL �EM� at your next affair. Customized interactive mystery shows for unique corporate events, team building, product launches, incentives, fund-raisers, private parties, and all special events. Complete event planning, locations, resorts, trains, cruise ships, or we�ll come to your location. Over 18 years experience, Nationally and Internationally. �Have Gun, Will Travel� . "It's a HIT! No pun intended." 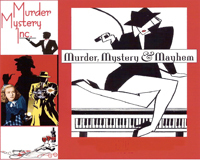 Fox TV " MURDERED BY THE MOB�, Interactive murder mysterydinner theater in NY City, NOW IN IT�S 10TH YEAR!